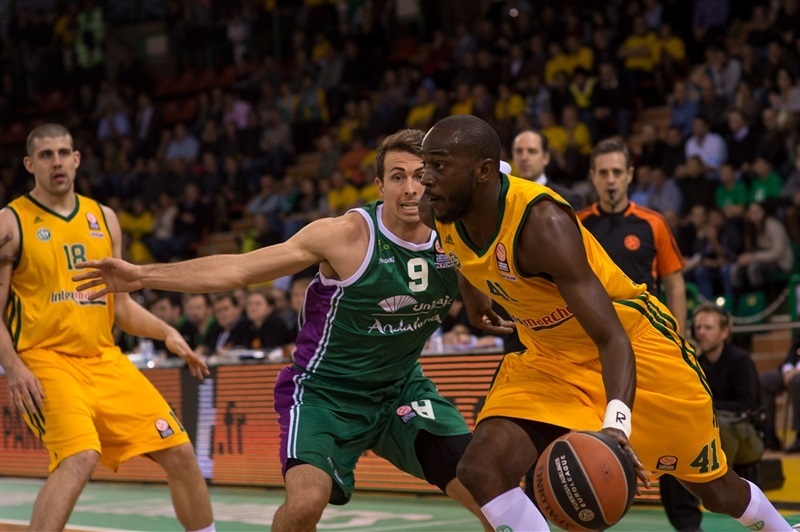 Limoges CSP came back from a 20-point deficit to beat Unicaja Malaga 67-64, snap a five-game losing streak and stay alive in the race to reach the Top 16. 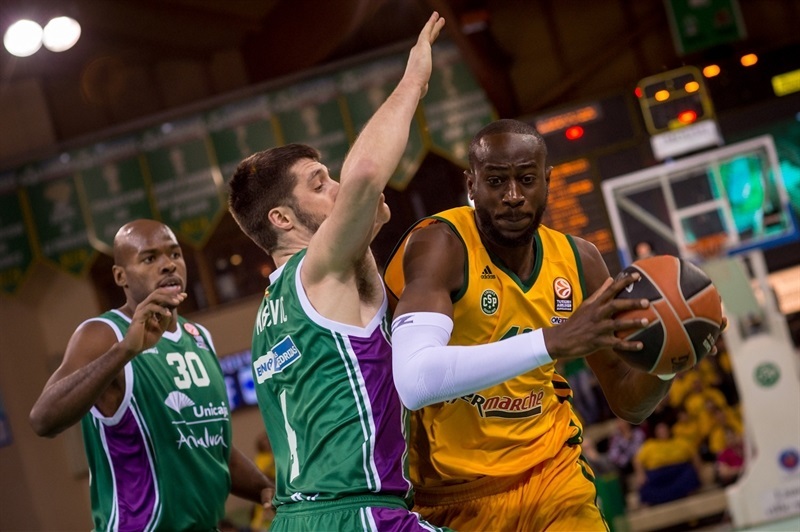 Limoges improved to 2-6 in Group B, while Unicaja dropped its fourth game in the last five to move to 4-4. 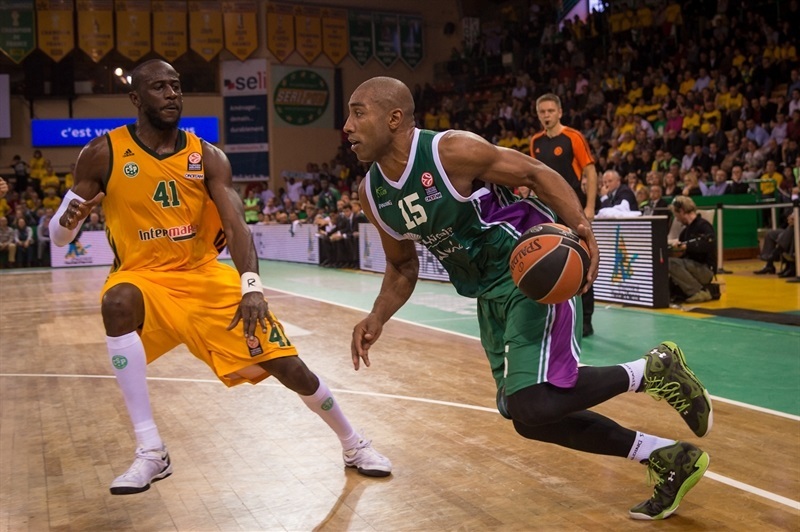 Despite the loss, Unicaja salvaged a potential tiebreaker from Limoges, which mathematically secured its passage to the Top 16. 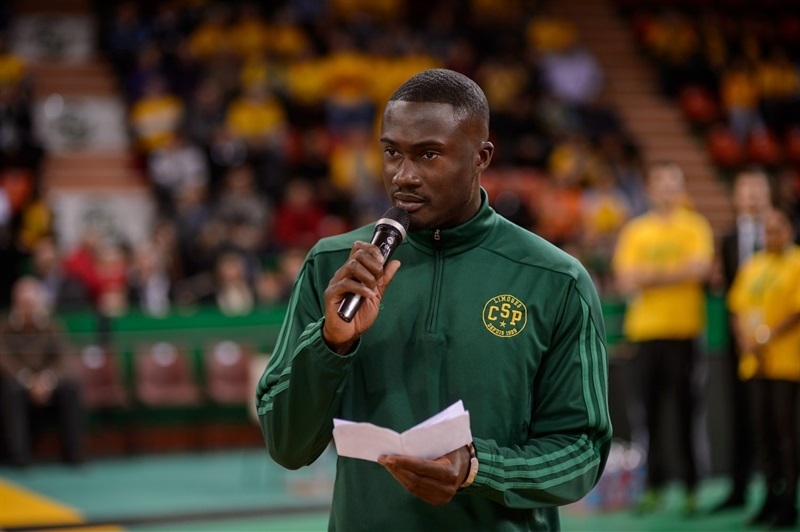 Jamar Smith nailed 4 three-pointers to score 18 points to lead Limoges, while JP Batista had 14 points, Nobel Boungou-Colo added 12 points, 7 rebounds and 4 assists, and Adrien Moerman collected 9 points, 11 rebounds, 3 assists and 3 steals. Limoges ended up making 6-of-26 three-pointers after missing its first 11 from downtown in the game. Ryan Toolson paced Malaga with 15 points while Stefan Markovic scored 11 in the loss. 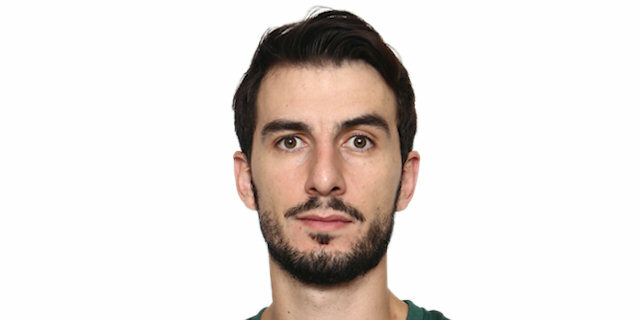 Unicaja dominated the proceedings early and led 12-32 in the second quarter. Limoges closed the gap to 21-34 by halftime and completed the comeback by tying the game at 41-41 in the third quarter. The fourth quarter was a thriller and the game came down to the final seconds when an Unicaja three-point attempt missed at the buzzer. Limoges coach Jean-Marc Dupraz didn’t make a change in his starting line-up with Leo Westermann, Ramel Curry, Boungou-Colo, Moerman and Frejus Zerbo. 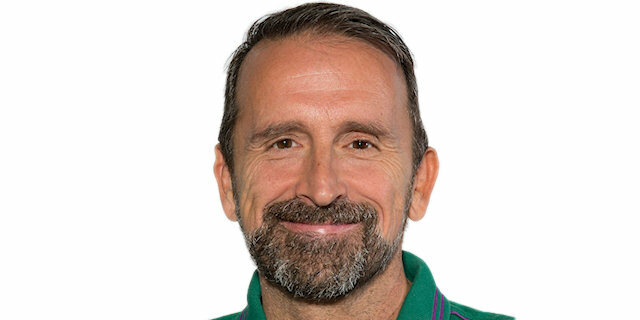 Unicaja boss Joan Plaza swapped two players with Toolson and Caleb Green coming in for Kostas Vasileiadis and Will Thomas alongside Markovic, Mindaugas Kuzminskas and Fran Vazquez. Zerbo opened the scoring for the hosts and Toolson knocked down a three from the left wing to put Unicaja on the board. Green followed with a jumper and Vazquez stole the ball, hit a layup and got the bonus to open a 2-8 lead. Limoges finally tallied another basket after more than three minutes without a score on a Boungou-Colo dunk, and Trent Plaisted’s layup made it 6-10. But Markovic nailed a straight-on three and Kuzminskas scored over James Southerland for a 6-15 lead. Ousmane Camara got a tip-in for Limoges to trim the deficit to 7, but Green knocked down another jumper for an 8-17 advantage after 10 minutes. The 8 points was the second-worst offensive quarter for Limoges this season following its 5 points versus CSKA Moscow in the fourth quarter. 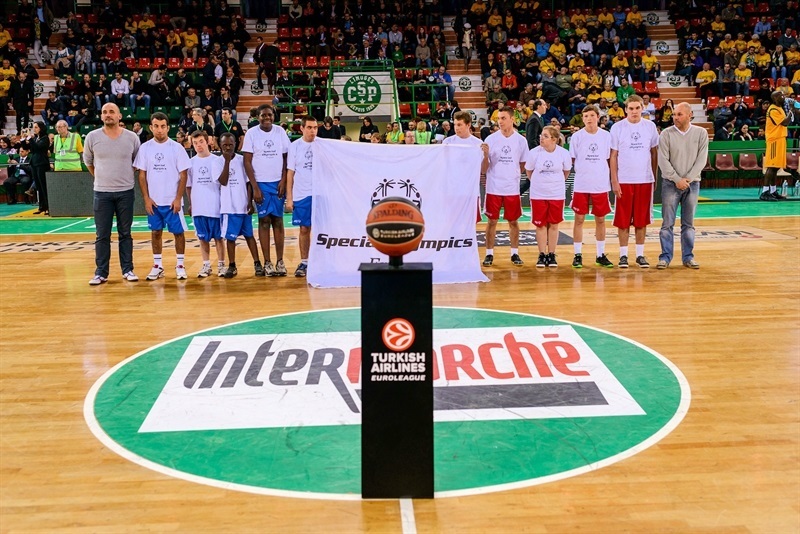 Jon Stefansson hit the first basket for the guests in the quarter while Limoges continued its offensive struggles with Thomas and Vladimir Golubovic scoring to push the advantage to 8-23. Moerman finally scored for the hosts on an inside basket more than three minutes into the period. But Markovic punched back with a triple and Golubovic made it 10-28, resulting in a Limoges timeout. Moerman scored out of the timeout, but Kuzminskas hit a jumper and Thomas threw down a put-back dunk for a 12-32 lead. Jamar Smith raced down to the other end for a driving layup and the hosts finally got some defensive stops. Batista hit inside and Westermann converted a three-point play to trim the deficit to 19-32. Vazquez stopped a mini scoring drought of two minutes with a jumper before Batista’s free throws made it 21-34 at halftime. 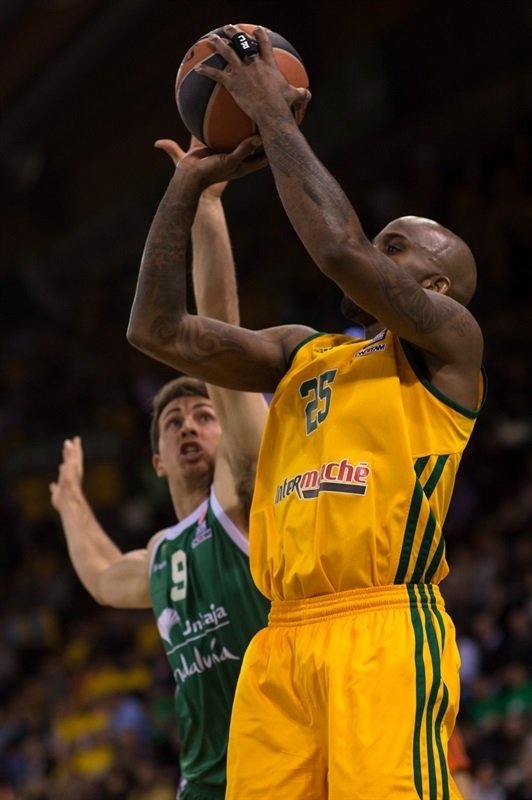 Batista opened the second half by cutting the deficit to 11 points and after Toolson’s jumper, Smith finally hit Limoges’s first three-pointer – after 11 straight misses – to make it a 10-point game. 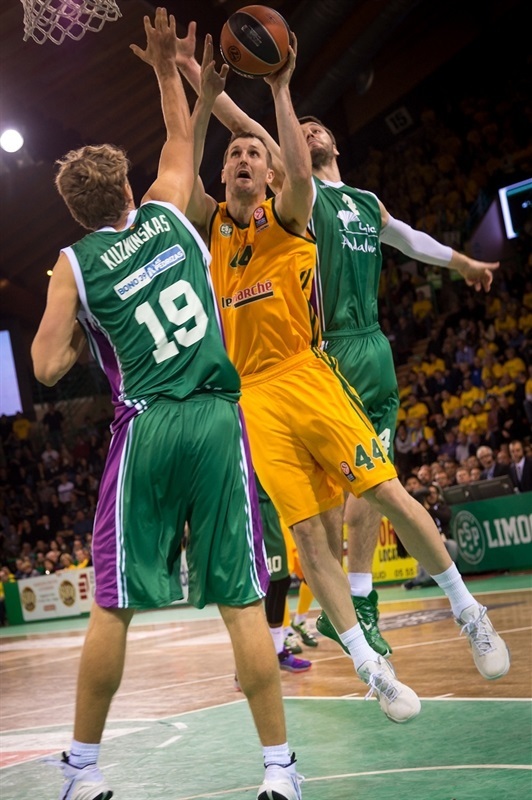 Smith then stole the ball and fed Westermann for a fast break layup and a 28-36 scoreline. Thomas converted a three-point play, but the hosts remained determined as Batista scored two inside baskets and Smith knocked down another triple to make it 35-41, resulting an Unicaja timeout. Coming out of the talk, Stefansson turned the ball over on the inbounds pass to Curry, who fed Smith for a layup. 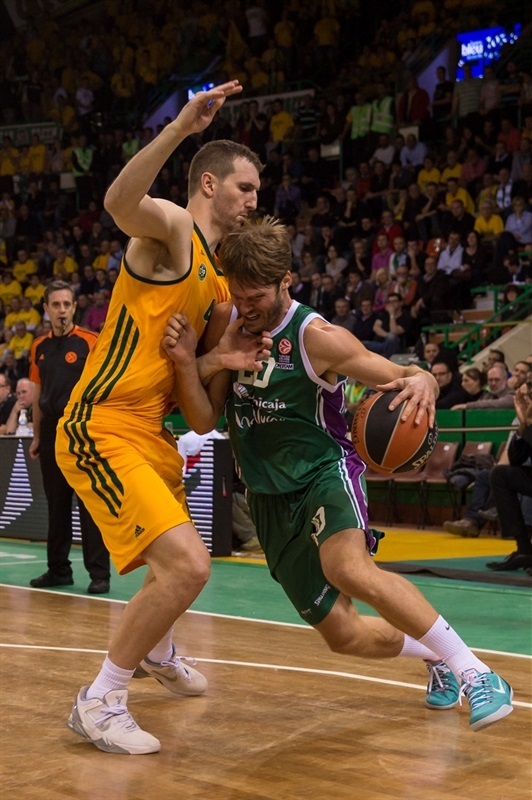 Unicaja continued to struggle and Batista scored back-to-back baskets to even the game at 41-41. Stefansson finally stopped the visitors’ five-minute scoring drought with a three-pointer to make it 41-44. Boungou-Colo somehow put back an offensive rebound, but Carlos Suarez’s layup put the guests up 43-46. Smith had the first basket of the fourth quarter and Boungou-Colo’s alley oop dunk gave Limoges an improbable lead, 47-46 with seven minutes left. Toolson finally got Malaga on the board with a three-pointer at the 6:35 minute mark to put the guests back ahead 47-49. After Limoges came up empty, Green drained a long three for a 5-point lead and another Limoges timeout. Westermann answered with a triple and a Moerman three from the left wing got the hosts back to within 55-56 inside of four minutes to play. Smith followed suit with a triple from the left corner and Limoges led 58-56 with two minutes to play. Markovic was not fazed as he hit a driving layup and bonus free throw. 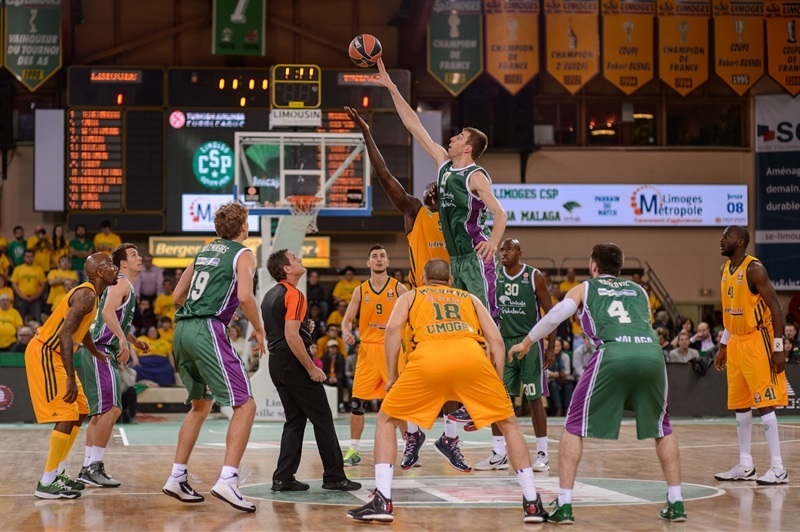 Boungou-Colo came up with another highlight play with a dunk of Moerman’s missed three to push Limoges up 60-59. After Markovic’s free throws, Smith nailed another three for a 63-61 lead with 57 seconds left. After Toolson and Granger both missed shots, Moerman made free throws with 16.6 seconds left. Unicaja would not go down without a fight and Toolson nailed a three with 10.9 seconds to make it 65-64. Boungou-Colo made 2 free throws with 7.4 seconds. Toolson missed 2 free throws in the waning seconds and Suarez missed a three-pointer that would have tied the game. "I don't think what happened in the third quarter happened because of us playing with less intensity. They tried something, which broke our rhythm, a pressing zone allowing a lot of open three-point shots and we had a very low percentage. That, together with our 17 turnovers, explains why we lost the game. We have to learn not to settle for anything. If we want to keep going in the Euroleague, we cannot allow these runs and these shot selection mistakes. I hope we learn from this. We didn't manage to find answers." "At halftime, we had 13 points less, but we know at this level, that can go very quickly. It’s a beautiful victory for the club, the fans and us too. "